In a perfect world, we’d all wear sweats and comfy t-shirts for the duration of the second and third-trimesters. Alas, that isn’t an option for working women who need a wardrobe worthy of their professional status. The following tips will help you curate a maternity wardrobe that’s both stylish and comfortable (a key to surviving the full pregnancy term!) – and that will bide your time through the postpartum body should if you plan to return to work. The good news is you have time to transition your wardrobe from pre-pregnancy to full-blown maternity. Odds are you have some blouses that can expand without affecting their look and cut so pull those to the forefront. As for pants, I recommend investing in a Bella Band ASAP. The Bella Band allows you to wear your favorite button-zip, pants, jeans and skirts – long after you’ve had to unbutton and unzip. It hugs your belly snug enough to hold the waistband up – without causing discomfort or compromising your sweet baby in any way. The Bella Band also allows you to get into your favorite jeans sooner, rather than later, after the baby is born. Maternity clothes can be expensive, and it’s frustrating to spend money on clothes you’ll only wear when your pregnant – which typically occurs once or a few times in a lifetime. If you’re worried about how to budget for maternity clothes, whilst also spending money on clothing and must-have items for your new baby, online consignment shops are a godsend. The combination of great prices, and the ability to sell clothes back again when you’re done, makes consignment/used maternity clothing sites a smart place to shop. Once your baby is born, you’ll realize the value of buying clothes s/he will grow into. Your quest for maternity clothes offers the opportunity to practice that “buy-up” mentality. Your belly will continue to grow until the day your baby is born. Plus, thighs, hips and breasts expand along with it – so buying clothes that grow with you ensures your comfort – and increases the amount of time you’ll be able to wear them. First-timers often get so excited to buy maternity clothes that they buy a bunch all at once. This can mean a closet full of maternity clothes that are too small by Month 6/7 or that don’t keep you warm or cool enough if you didn’t think ahead in terms of seasons and climate. Your best bet is to purchase professional maternity clothes as you need them. If you can’t resist the urge to buy them all now, refer back to #3 (clothes that grow with you), project the expanding sizes you’ll need between now and Month 9 and think about your need for heavier- or lighter- materials you’ll prefer as the months and seasons fly by. There are plenty of tailored maternity clothes available, but do pay attention to breathability as pregnancy can mean you run hot to cold – or vice versa – more often than you do now. You want clothes that breathe when you’re hot and won’t trap perspiration. If you’re someone who prefers tighter, tailored clothing – this is a good time to explore your looser, and more flowy side. Skin can get itchy (especially around the breasts, belly, hips and thighs) and tight-fitting clothes exacerbate that. Do you have professional friends who have been pregnant before and plan to be pregnant again? Odds are they’ll be happy to let you borrow their professional maternity wardrobe stash. The combination of a few staple maternity items (black/grey/brown pants and versatile tops – for example), and a few choice picks from friends’ maternity collections, may be all you need to complete your workday wardrobe. There are a handful of reputable companies that rent maternity clothes for a monthly charge or tiered- subscription. Not only is this a price-conservative way to go about it, it’s also great for those who have limited storage space when you no longer need the clothes. Rental options also allow you to find unique, designer and ultra-chic professional options for a fraction of the price of a permanent purchase. Good luck on your quest for comfortable, affordable and stylish professional maternity clothes. In the meantime, are you interested in hiring a professional and experienced maternity and newborn photographer? Schedule a booking with Lemonshoots. 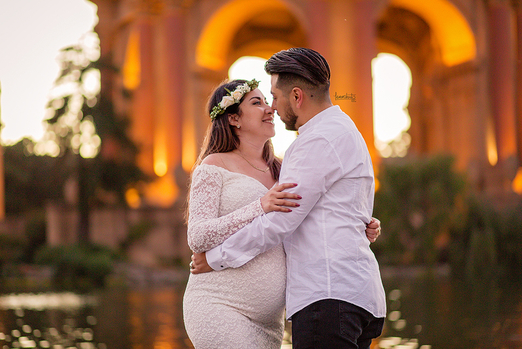 In addition to priceless images that capture the magic of your moment, I provide gorgeous maternity gowns so you don’t have to buy a thing!